11 Şubat 2019 Pazartesi 16:02 - 8 reads. Maurizio Sarri expects to talk future plans with Chelsea, after a bad period for the club, culminating in a total meltdown and a 6-0 defeat to Man City on Sunday evening. After the match, the feisty Italian is allegedly so angry that he refused to give hand to the colleague and slayer Pep Guardiola. But in a subsequent interview with Sky Sports, it was a sight Sarri, who acknowledged that his job may be hanging by a thin thread. - I have the responsibility for the team, so yes, I am under pressure. at the same time, he lifted also a little of the veil, how the working relationship between himself and club owner Roman Abramovich works. A relationship, which apparently is non-existent. - If the president is calling, so I will be happy, since I never hear from him. To be honest, so I don't know what I should expect, said Maurizio Sarri to Sky Italia after the match. the Defender César Azpilicueta felt compelled to apologise to the club's fans. - It is difficult to find words that can describe my feelings after the fight, he says to the Chelsea website. - It is one of the worst nights in my career. It is really frustrating and disappointing. - When you lose 0-6, must all accept that they are not played well. The only thing I can say to the fans is sorry, says César Azpilicueta. 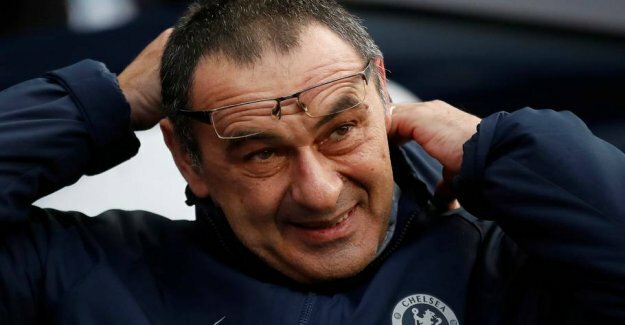 Maurizio Sarri is manager number 15, who have tried their luck in Chelsea since Roman Abramovich took over the club in the year 2000. And, according to Manchester United icon Gery Neville, who today supports himself as a TV-expert for Sky Sports, is it about time to block the revolving door and issue a change of direction in the club from west london. For the en Sarri was brought to Chelsea as a replacement for Antonio Conte, it was not just to win trophies. He also had to implement a new playing style at the club with a focus on a more exuberant offensive. A trademark, as the Italian was hailed far and wide in his time as Napoli manager. - If the owners of the club really want football of a higher quality, so they have to live through the changes. Now is not the time to show signs of weakness, he says.